A Paraklesis to the Most-Holy Theotokos was celebrated in the evening of August 8th in the ruins of Panagia Paramythia Church in Vlach Saray of Constantinople after 40 years, attended by Ecumenical Patriarch Bartholomew. The Church of the Panagia Paramythia, or "Panagia of the Palace", in Constantinople was the location of the Ecumenical Patriarchate of Constantinople from 1587 to 1597. It was here that the autocephaly of the Russian Church was proclaimed in 1589. 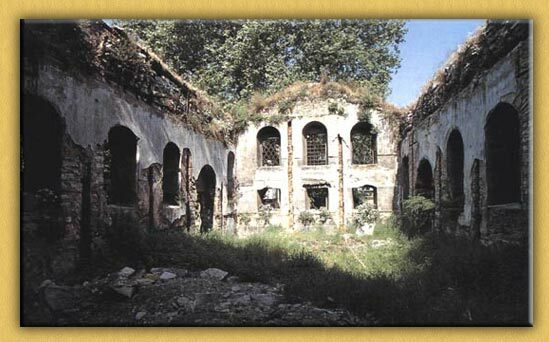 In the past the princes of Moldovlachia (Romania) were crowned here also, since in this area of Constantinople the rulers of Wallachia had palaces, and so the church came to be called Vlach Saray (Palace of Wallachia). In the 1970's the church suffered severe damage from various fires. At the event, the Ecumenical Patriarch stated: "It is our duty to deliver to the younger generation the buildings of our ancestors." It is hoped that this church will soon be restored to resume parish activities in the area. Ο ΟΙΚΟΥΜΕΝΙΚΟΣ ΠΑΤΡΙΑΡΧΗΣ ΣΤΗΝ ΠΑΡΑΚΛΗΣΗ ΣΤΑ ΕΡΕΙΠΙΑ ΤΟΥ ΒΛΑΧΣΑΡΑΪ ΜΕΤΑ ΑΠΟ 40 ΧΡΟΝΙΑ!